"SOLDIER, REST; THY WARFARE O'ER, DREAM OF BATTLEFIELDS NO MORE"
Death, who has been looking over their shoulders for a long time, has attained another objective. 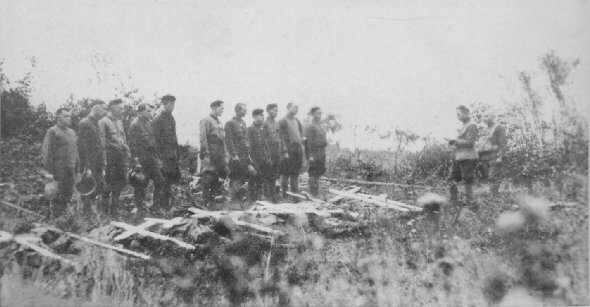 Lieutenant Chaplain Finell, 123rd Machine Gun Battalion, 33rd Division, is performing his daily dutylast rites for the dead. 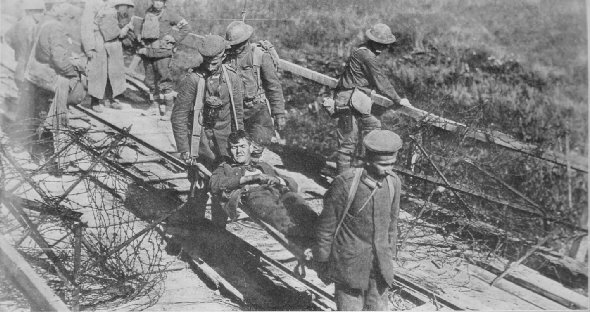 A parade of German prisoners of war, carrying their own wounded men, was always moving toward the rear of the American lines. The cry of a wounded enemy is almost as nerve-racking as the cry of one's own wounded soldiers.